Kazuyoshi Saito made his debut in 1993 with his first single “Boku No Mita Beatles Wa TV No Naka” and released the smash hit single “Aruite Kaero” in the following year. 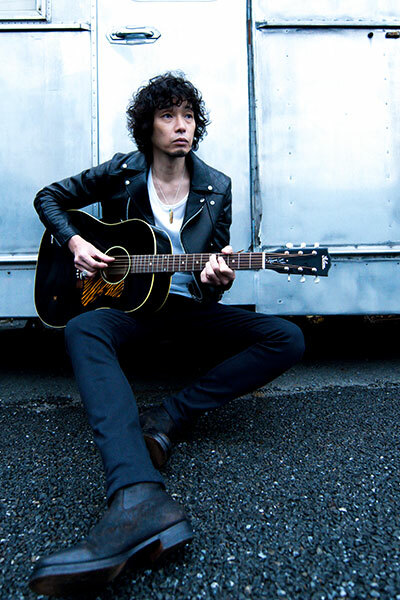 He has released various hit tunes such as “Utautai No Ballad,” “Wedding Song,” ”Zutto Sukidatta,” and “Yasashiku Naritai.” His performing styles are varied from solo acoustic to full band productions. In addition to his own music activities, he often writes and produces his songs for various artists. In 2011, he formed the band “MANNISH BOYS” with top notch Japanese drummer, Tatsuya Nakamura, releasing three albums with the group. Kazuyoshi will celebrate 25 years in the music industry in 2018. His 19th original album “Toys Blood Music” was out in March and he performed at 41 locations for four months all around Japan. The interview took place at the Gibson acoustic factory in Montana on December 2017 while Kazuyoshi visited there for final check of his latest “Gibson Kazuyoshi Saito J-35”. Q1. What features make your signature J-35 special to you? A1. What I think is special is its ebony color. The J-35 is one of my favorite guitars, but I had’t seen one in ebony. So I made it ebony. Also, we talked a lot about the color of the “Fire Stripe” pick guard until we got it right. Q2. Talk about the specific tone you get from the guitar? How would you describe the sound? A2.I think it has a richer and rounder sound, especially in low, than a J-45 due to its lowered sound-hole location. Q3. Talk about the looks of your J-35. You chose ebony on it like your past signature models, but do you think looks are also important for any guitar? A3. The appearance is the most important aspect for me to choose a guitar. If you get a guitar with your favorite look, you ultimately play it many times—then guitar will get better sound as you play. So I think the best way to choose the guitar is first to get one with your most favorite appearance and looks. About 25 years ago when I got the first ebony J-45, I hadn’t seen an ebony acoustic guitar, but I fell in love with that guitar at first sight. Ever since then, ebony acoustics have been the coolest guitars for me. That’s why I wanted this J-35 with an ebony finish. Q4. Talk about the specific feel you get from this guitar? How is the playability? A4. Feels pretty comfortable—I asked for the neck to be slimmer than my KS J-45. Frets are thin as are an original J-35. It has rich and clear sound with my favorite neck profile. It has superb playability. Q5. How does this J-35 help you achieve the specific artistic expression you are seeking? A5. I used this J-35 on some songs during my Japan tour, which are more folk-song like. I think it suits a gentle song more. Gibson guitars always have perfect volume balance between my voice and guitar sound. If I play soft, the sound gets soft and if I play strong, it gets strong. A Gibson guitar is always easy to sing along with. A Gibson guitar has good balance and so does this guitar. It is a really good match when you sing solo with just a guitar. Q6. What is the first thing you notice about a guitar when you pick it up? A6. Again the most important thing for me is if I like the appearance/looks...I feel the guitar is calling...when I go to MI stores, it feels like it says it wants to be bought by me. It is how you meet the guitar. If the guitar has my favorite appearance to make me feel I want to play it, then the sound is right, there is no guitar with bad sound if you like its appearance. Q7. Did you use J-35 at recent live concert or recording? And did you use J-35 for your new album recording? How was that? A7. I used this J-35 for making most of the songs on my new album. As it has a thermally aged top, it already has a vintage sound from the beginning. The sound is so good through a microphone when recording. It has vintage sound already, which is totally different from brand new guitar. If I do a blind test, I am afraid I can’t tell the difference between it and an actual vintage guitar. Q8. How many Gibson guitars do you own? What things do you like about Gibson guitars? Q9. Talk about your connection to your instruments...do you relate to them as simply tools of expression, or do you personify them and have an emotional connection? A9. Definitely it is not just a tool. Maybe I feel it's more like a partner. I wanted to say it is a part of my body, but I am not that skilled. I want to be, though. Guitars and musical instruments are really interesting things...they are something representing my feeling inside. Especially guitar, it is the one I could simply represent my feelings with. The same guitar sounds different when playing with different feelings—I don’t think it is just a tool. Q10. Are you interested in how the guitar is made and have you tried to make one by yourself (spray painting your own guitar?) What motivated you to do that? A10. Yes, I am especially interested in painting the guitars. I tried various ways to spray with my own style, but it just didn’t work well...when I watched spraying at the factory, I feel I wanted that machine at home. I usually like to make things by myself like furniture; it is like my hobby, so I feel like I want to make a guitar as a hobby...Of course as I don’t know how to make the guitar...I just paint it or change my pickups...But I really enjoy seeing the process at the factory. Q11. If you had to go back in time and you could be anything in the world, other than a musician, what would you want to be? A11. Ummmmmm...maybe a musician again...there is nothing else I want to be...even if I didn't sing, maybe I'd want to be a part of a band—playing guitar or drums...right now I am a solo artist but I always wanted to play in a band...I couldn’t find the right band when I debuted...I actually wanted to do that...yeah I wanted to be a member of a band.